In ‘Around The Table,’ we highlight member news and share information on industry trends. This week, we spotlight on Boeing, Alaska Airlines, JP Morgan Chase, Starbucks, L’Ecole N° 41 , and Weyerhaeuser. Washington business leaders will be visiting classrooms next week to talk to South King County students about great job opportunities in our state and encourage them to aspire to postsecondary education. Executives scheduled to visit schools include Roundtable members Ray Conner, CEO of Boeing Commercial Airplanes; Brad Tilden, CEO of Alaska Airlines; and Phyllis Campbell, Pacific Northwest chairman for JP Morgan Chase; as well as Dara Khosrowshahi, CEO of Expedia; and Lucy Helm, general counsel of Starbucks. Read more in The Seattle Times. Students also will have opportunities to visit companies such as Alaska Airlines, Amazon and Expedia to get a hands-on look at careers in our state. 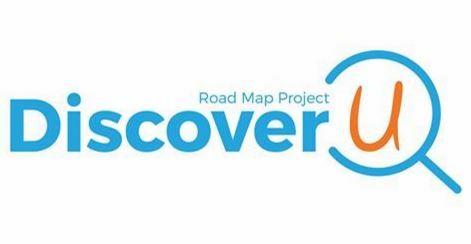 The events are all part of Discover U, a regional effort spearheaded by the Road Map Project – with support from Challenge Seattle – which works to increase the number of students on track to graduate high school ready to go on and earn a postsecondary credential. You can follow the effort on Twitter and Facebook. Roadmap is also inviting businesses interested in hosting worksite tours or participating in career panels to connect with them online. Fill out a business interest form here. Weyerhaeuser has a new home. 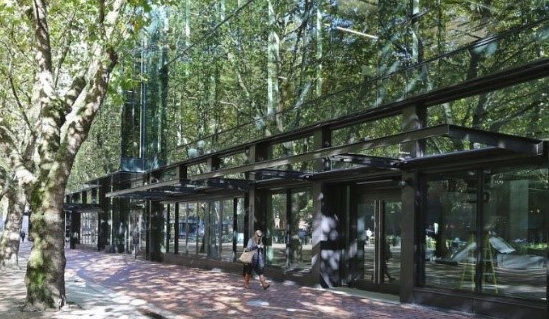 After decades in Federal Way, the company opened its new, urban “tree fort” headquarters in Seattle’s Pioneer Square. The move signals an effort to attract the next wave of young employees, says CEO Doyle Simons. “This is just a different type of building that sets a different tone for where we’re heading as a company,” Simons said. “We’re looking forward to being here for a very long time.” Read more here. Washington employers are anticipating an historic number of job openings in the coming years, according to our first Washington Kids For Washington Jobs report. An estimated 740,000 job openings will be available in our state over just the next five years and state job growth with nearly triple the national average. One employer hoping to hire qualified Washington graduates is Pacific Northwest National Laboratory (PNNL) in Richland, Wash. PNNL, one of 17 Department of Energy National Laboratories, expects to hire many workers in the coming years, with growth in the fields such as chemistry, data analytics and cyber security. Washington employers, like PNNL, are creating exciting job opportunities that offer excellent wages and strong potential for upward mobility. These opportunities should be open to Washington kids whenever possible. That will only happen if we all work together to ensure more of our Washington students go on to attain the postsecondary credentials required for success. The Washington Roundtable has set an ambitious goal: By 2030, 70 percent of Washington students will earn a postsecondary credential by the age of 26. 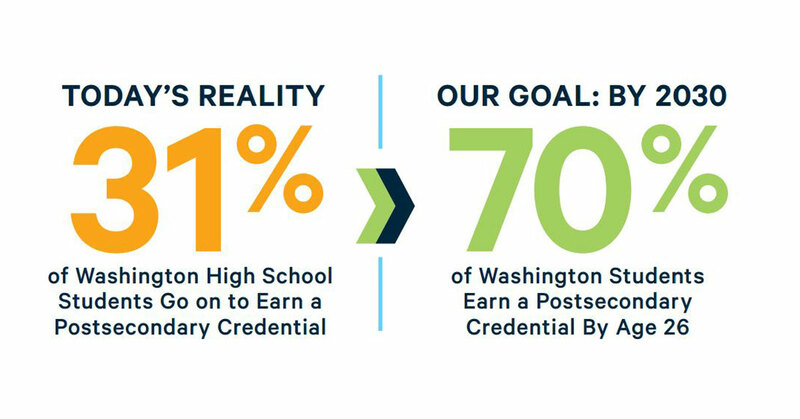 Today, only 31 percent of Washington high school students go on to earn a postsecondary credential. Raising that to 70 percent will reap significant benefits for our kids who, with a credential in hand, will each earn nearly $1 million more in their lifetime. It will have the added benefits of reducing unemployment and cutting poverty. Learn more about Pacific Northwest National Laboratory, and check out the Washington Kids for Washington Jobs report. The following was originally posted on the Gates Foundation Impatient Optimists blog. There will be 740,000 job openings in the next five years—are Washington’s students prepared to get those good jobs? Job growth here is expected to nearly triple the projected national growth rate. Thanks to strong anchor employers, growth in new companies and industries, and workers retiring or leaving the state, students sitting in our classrooms today will enter a job market bursting with opportunities. The question is, will they be ready? Looking at publicly available data and hiring forecasts from Washington Roundtable member companies, we examined the scope and types of job opportunities that will be available, the associated skills requirements for those jobs, and how the education attainment of Washington students compares to future marketplace demand. What we found summons us to action. Increasingly, the jobs of the future will be filled by workers with postsecondary credentials, ranging from industry-specific certificates to two- and four-year degrees. • Thirty-five percent (or 260,000) of projected openings will be “career jobs.” These are higher skill jobs with more opportunities for advancement and higher compensation (salary range of $60,000 to $100,000+). Examples include registered nurses, teachers, and systems analysts. More than nine in 10 workers who fill these positions will have a postsecondary credential (73 percent) or some college (18 percent). • The largest number of openings – 45 percent (or 330,000 jobs) – will be “pathway jobs.” These jobs offer salaries ranging from $30,000 to $45,000 per year and a route to a career job. Examples include service and retail jobs, office administration and skilled trades. Workers with a credential or some college will fill nearly two-thirds of these jobs. • Just 20 percent (or 150,000) of job openings will be “entry-level.” These positions – in fields like food service, farm labor and housekeeping – offer opportunities to gain important work experience. Workers with a credential or some college will fill nearly half of them. Salaries average $20,000 to $30,000 per year and there is rarely a route to upward mobility without additional education or training. The clear takeaway is that good jobs will be available here and most will be filled by workers with a credential or some college. But right now, fewer than 1 in 3 Washington state students go on to earn a postsecondary credential. The number of Washington students who go on to complete training or college after high school must more than double if our students are to be prepared for the jobs of the future. The Washington Roundtable has set an ambitious goal: By 2030, 70 percent of Washington students will earn a postsecondary credential by the age of 26. In a class of 81,000 students, 70 percent postsecondary attainment means 31,000 more students will acquire a credential. Each will earn nearly $1 million more over his or her lifetime. Their success will reduce unemployment by a third and cut poverty by nearly half, saving our state $3.5 billion a year in social spending. 1. Improve school readiness, emphasizing services to low-income children and traditionally underserved populations. 2. Improve the performance of the K-12 system to ensure that more students graduate career- and college ready. 3. Increase participation of Washington students in postsecondary education, focusing on high-demand fields. 4. Help students, beginning in elementary school, understand career opportunities, inspiring them to think about their futures and develop necessary skills. In the nation’s 7th fastest growing state economy, Washington’s students should be the first in line for great jobs—but that will only happen if employers and educators work together. Read the report and learn more here. Steve Mullin is president of the Washington Roundtable. Joel Janda is a partner and managing director at The Boston Consulting Group. 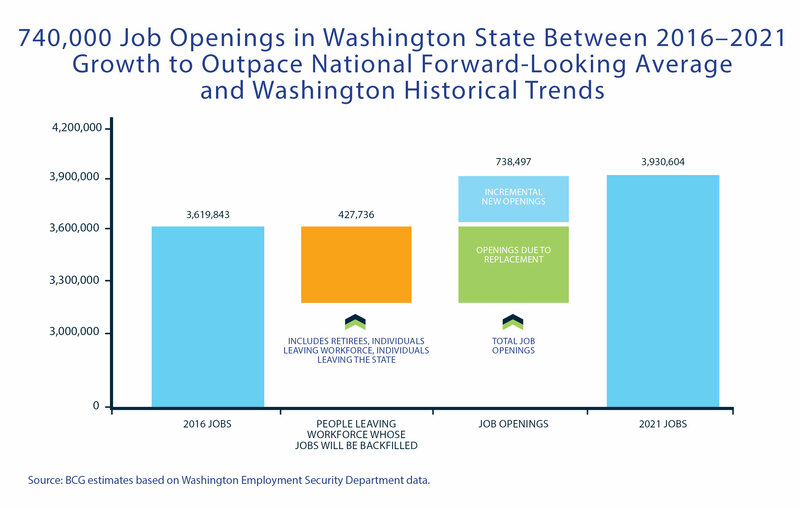 Key Findings: There will be 740,000 job openings in Washington in the next five years. Most will be filled by workers with postsecondary education or training. Less than a third of Washington students earn a postsecondary credential today. SEATTLE – October 5, 2016 – There will be 740,000 job openings in Washington state over the next five years with state job growth that will nearly triple the national average, according to a new report from The Boston Consulting Group and the Washington Roundtable. The research finds that the majority of job openings in Washington will be filled by workers who have postsecondary education or training. However, less than a third of Washington students go on to attain a postsecondary credential today. There will be 740,000 job openings in Washington in the next five years. Of these jobs, 430,000 openings will be due to retirements and individuals leaving the workforce or state and 310,000 will be net new openings. State job growth is expected to exceed the state’s historic average and be nearly be three times the projected national growth rate. Thirty-five percent of projected job openings are classified as “career jobs.” These are higher skill, higher compensation jobs with a salary range of $60,000 to $100,000+. More than nine in 10 workers who fill these positions will have a postsecondary credential (73 percent) or some college (18 percent). Forty-five percent of projected job openings are classified as “pathway jobs.” These are jobs that have salaries of $30,000 to $45,000 per year and offer a route to a career job. Nearly two thirds (64 percent) of pathway jobs will be filled by workers who have a postsecondary credential (34 percent) or some college experience (30 percent). Twenty percent of projected job openings will be “entry-level.” These jobs provide important opportunities for workers to gain basic employment skills. They have a salary range of $20,000 to $30,000 and offer limited opportunities for upward mobility. Nearly half of these jobs will be filled by workers with a postsecondary credential (20 percent) or some college (24 percent). “The jobs of the future increasingly will be filled by workers with postsecondary credentials, ranging from industry-specific certificates to two- and four-year degrees,” said Steve Mullin, Washington Roundtable President. According to the research, only 31 percent of Washington students go on to earn a postsecondary credential today. For each class of 81,000 students, Washington would create 31,000 new credentialed graduates who will each earn an extra $960,000 over their lifetime. Over time, this would reduce unemployment by a third and poverty by almost half – all the while saving billions each year in state social spending. Improve school readiness, with an emphasis on low-income children and traditionally underserved student populations. Improve the performance of our K-12 system to ensure more high school students graduate career- and college-ready, with an emphasis on raising achievement among at-risk students and low-performing schools and students. Increase participation of Washington students in postsecondary education, with a focus on delivering degrees, certificates and other credentials in fields that will be in the highest demand. Help students, beginning in elementary school, develop better awareness of the careers that will be available, inspiring them to think about their futures, the skills necessary for the jobs that interest them and the pathways to attaining those skills. The full report along with a series of vignettes profiling job opportunities by category is available at waroundtable.com. For its research analysis, BCG drew from publicly available data, primarily from the Washington State Employment Security Department and the Bureau of Labor Statistics, as well as hiring forecasts provided by some Washington Roundtable member companies. The Washington Roundtable used data published by the Education Research & Data Center (ERDC) and the Office of Superintendent of Public Instruction (OSPI) to determine the postsecondary attainment rate of students who were enrolled in a Washington high school and expected to graduate with the class of 2006. The determination that 31 percent of Washington students attained a postsecondary credential is based on reported credential attainment of those students within seven years of the expected year of high school graduation. Additional detail on methodology is available in the full report. Washington Roundtable is a non-profit, public policy organization composed of senior executives from Washington’s major employers. 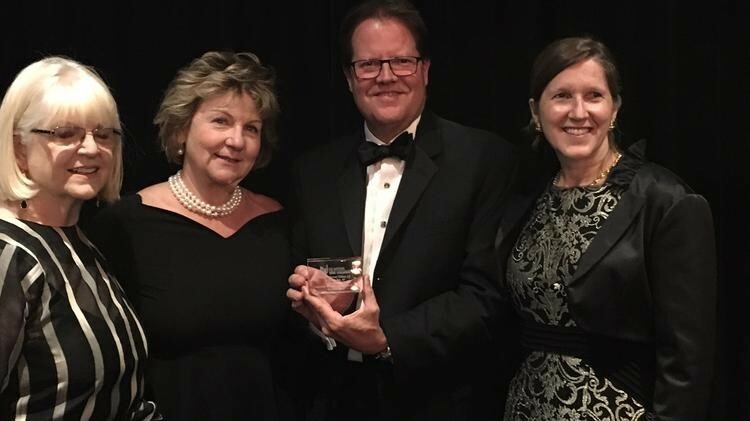 Since 1983, the Roundtable has worked to create positive change on state policy issues that foster economic growth, generate jobs and improve quality of life for Washingtonians. Learn more at waroundtable.com. The Boston Consulting Group (BCG) is a global management consulting firm and the world’s leading advisor on business strategy. BCG partners with clients from the private, public, and not-for-profit sectors in all regions to identify their highest-value opportunities, address their most critical challenges, and transform their enterprises. A customized approach combines deep insight into the dynamics of companies and markets with close collaboration at all levels of the client organization. This ensures that our clients achieve sustainable competitive advantage, build more capable organizations, and secure lasting results. Founded in 1963, BCG is a private company with 85 offices in 48 countries. Learn more at bcg.com.